I love the steam-punk genre. It’s all dirigibles, flying ships, clunky mechanical robots andÂ VictorianÂ inspired leather clothing. 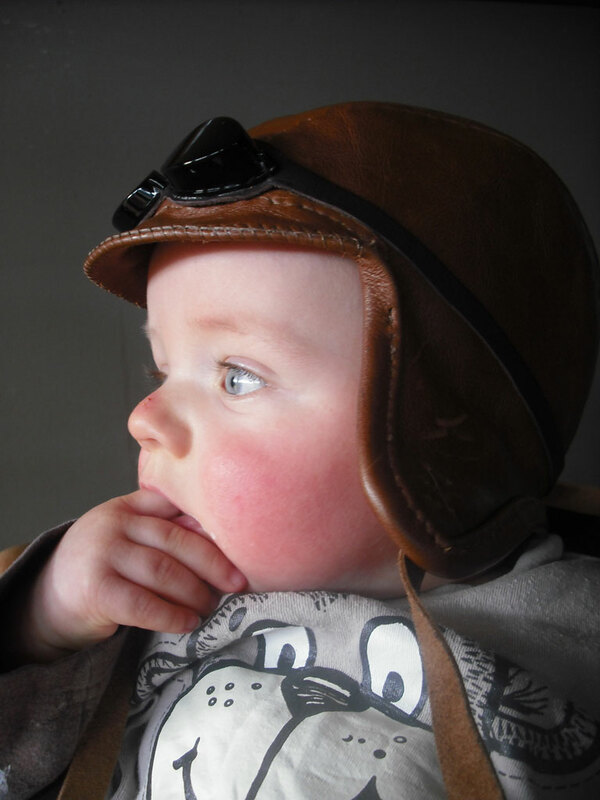 Â Of course, I’d look like a plonker dressed up in that stuff, so what better way to live out a childhood dream than to live it out through my (almost) 1 year old son? 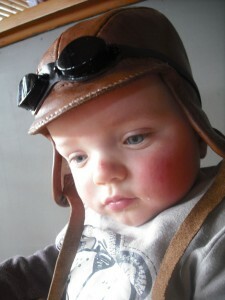 1) Search for good images of flight helmets on the internet, and pick one that you like. You’ll need a good front and side view so that you can see how the seams go. I picked the one here because I liked the shape. 2) Paper mÃ¢chÃ© your baby’s head. Ok, that is not very good advice. Don’t do that. 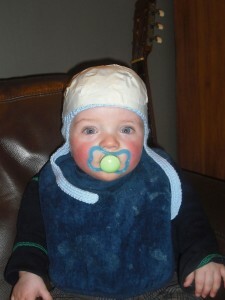 Instead, put a suitable hat on your baby and cover it in strips of masking tape. Enough tape so that when you take the hat off it keeps its shape. 3) Carefully remove the hat from inside the masking tape. It should hold its shape fairly well if you’ve used enough tape. Now add the ear flaps and any other bits and pieces. The inside is still super-sticky, so rip little bits of tissue paper line the inside with the tissue. 4) Using your reference photographs, draw seam lines on your finished model, and then *gulp* take a pair of scissors and cut it up along the seam lines. Â Flatten the pattern pieces out. Â All going well, you should have pairs of almost identical patterns. Note: photocopy the patterns lightly larger if you are going to use a thick lining material, such as fleece for example. 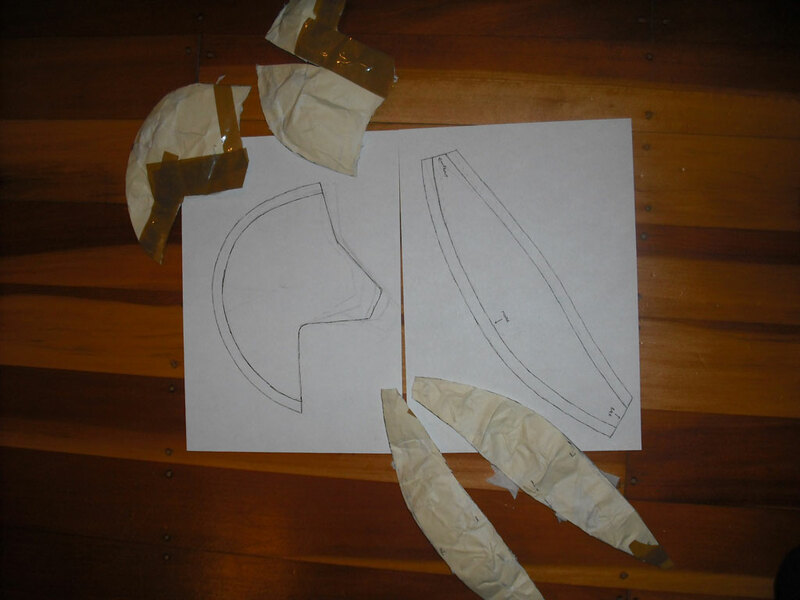 6) Cut out two of each of your patterns. 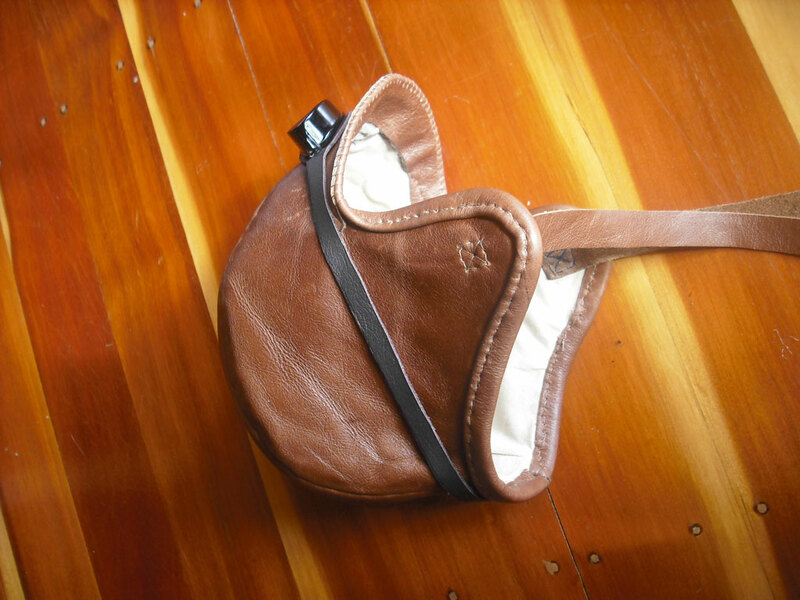 Use a low tac glue (like a cheap glue-stick) and stick them to the back of your leather, then carefully cut out the leather pieces. 7) Now for the time consuming part. Place two of the pattern pieces together (triple check to make sure they are correctly placed before you start). 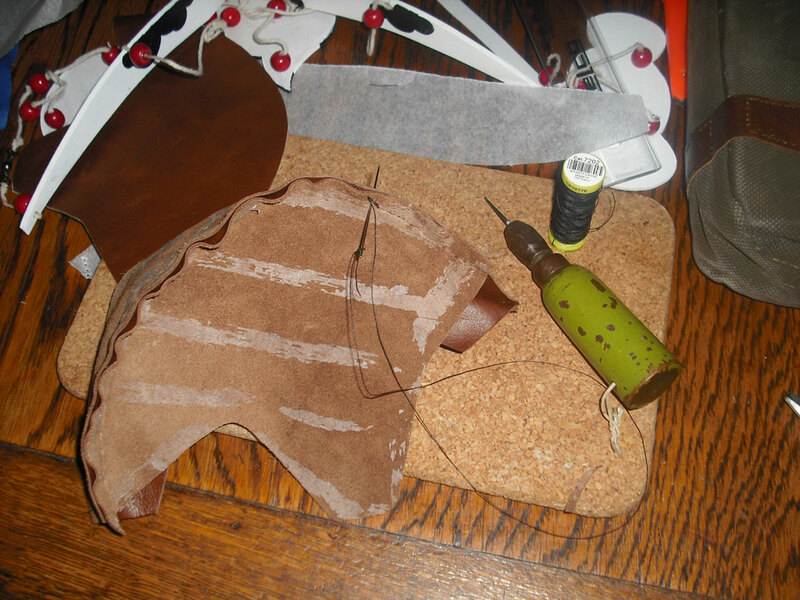 Just a couple of stitches at a time, make the holes with a leather awl and then double-stitch using two needles. Â I use a cork place mat behind the work, and instead of double stitch I just go all the way one way and then come back again. 8) Unfortunately no photos of much of the rest of the process, sorry! Â Continue to stitch the pieces Â until the basic cap is ready. It will be inside out with the seams sticking up. 9) Use a good leather cement and glue the seams down flat, splitting them so that each half is glued down on its own side side of the seam. 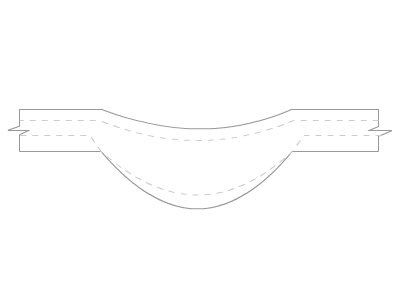 Use a roller (like a wallpaper roller) to flatten the seam nicely if you have one. Trim the ends of the seam if you need to. 10) Replicate steps 6 through 9 with the material you want to use for the lining, but use pins instead of glue when cutting the patterns. I used some relatively thin natural cotton, but you can use a fluffy fleece material if you want to go for that look – just remember to make your pattern a bit bigger so that the lining fits inside with your baby’s head. 11) Turn the lining the right way around and place it over the leather cap (which is still inside out). 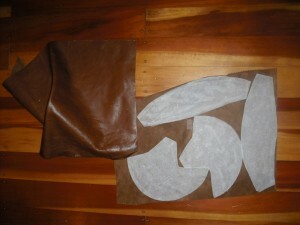 Using the leather cement, glue the outer edge of the lining to the outer edge of the leather. Now turn it the right side out. 12) Cut a long strip of leather about 35mm wide, and stitch it right the way around the edge of the cap to finish the seam. 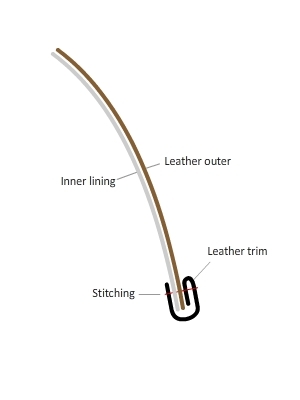 The leather needs to be folded like the diagram to achieve this. The stitching is difficult because of the multiple layers of leather and fabric, but this trim really helps finish the cap. 13) If you want a peak, incorporate this in the trim. 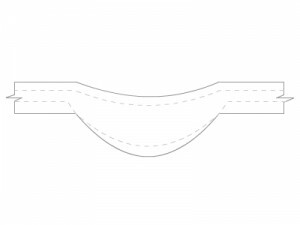 Instead of a straight strip, cut the trim similar to the diagram below. 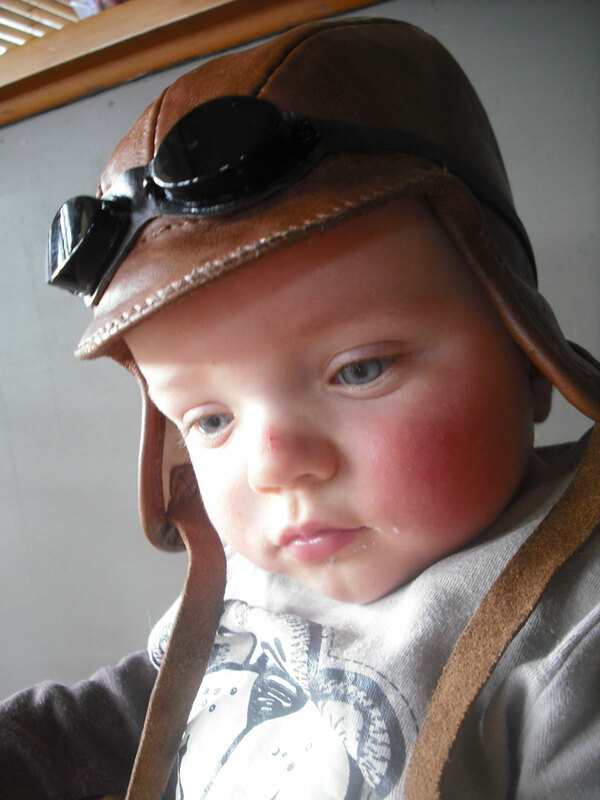 14) Once the cap was ready, I found that the seams around the front of the cap left marks in my son’s forehead because they were not smooth enough. I cut another strip of leather and glued this into the inside of the cap as a hat band, covering all the seams with the soft part of the leather facing the inside. 15) Add accessories! 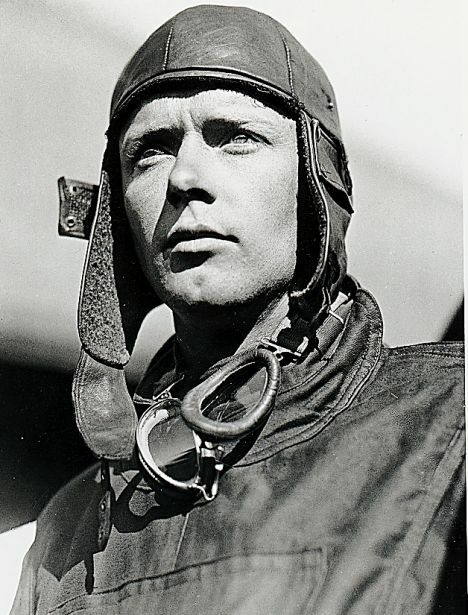 This cap has a couple of straps and a pair of flying goggles made from an inexpensive pair of tanning booth goggles. This is how Kathe Kruse made her very first famous baby dolls as well! Early 1900! Did Kathy Kruse completely paper mÃ¢chÃ© her baby? thanks a million! I’m costuming a charlie brown play and needed a Red Baron helmet for Snoopy. Came across your blog and got inspired. Will post results on flickr soon and send you a link. Your work is wonderful! Thanks Julie 🙂 Just a hint – make the patterns a little bigger by photocopying them up to maybe 110% after you trace them on to paper. Also, this would be a lot faster if you used a material you could machine sew instead of leather (if time is an issue). Glad you like it! 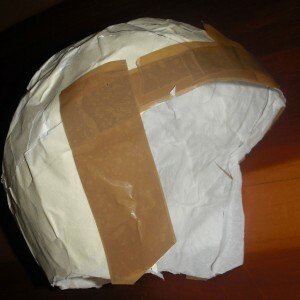 well I didn’t read your last comment until after the helmet was finished! But it worked just fine, I think I got some extra room from notching the pattern pieces to lay them flat. Here’s the result! Thanks so much for posting your project…I love the idea of making the form first. Ten + years of costuming and I had not thought of that! Wow – that is absolutely fantastic! Much better than my effort 🙂 You are a very gifted costume designer/maker! Did I ever tell you that your Oma was quite an accomplished dressmaker, who studied for it for quite a few years, and from then on designed and drew her own patterns! You have that gene! Hmm. I haven’t designed any dresses yet. Working on a wind power generator now. That’s pretty close.